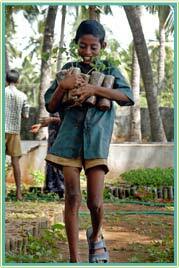 Green Hands is project launched by Isha Foundation in Tamil Nadu, South India. Their goal is to bring back 10% of green cover in Tamil Nadu's where the population is over 62 million and it's size is approximately of size of Kansas (13th largest in the US). Since, 2007 and 2008 tree planting campaigns have led to the plantation of 7.1 million of trees! True human potential is far far beyond what we think it is. Just about anything is possible once we put our hearts in it. 7.1 million trees planted just by hand! This large-scale tree planting project will enhance biodiversity, protect the soil, restore ecological balance and provide livelihood opportunities for thousands across the state. Mass awareness campaigns are planned to establish a culture of care for the environment. Starting from the geographical land area of Tamil Nadu, Project GreenHands seeks to inspire people around the world to keep this planet habitable for future generations. This compelling plan reestablishes the power of individual action for large-scale change. The project is a massive effort in community building, encouraging supportive relationships between urban and rural societies, government and industry to shape the course of the world.